There are many people in the world who suffer from diabetes. It is a common ailment, but despite the seriousness of the issue, there still isn’t a cure for it. All anyone can hope to do is manage their symptoms and take care of themselves the best way they can. Hypnosis is a great tool to help people manage their diabetes because of the psychological aspects associated with the disease. In a study conducted by Yuan Xu and Etzel Cardena in 2008, it was found that hypnosis works well as an adjunct to insulin treatment. The researchers found that hypnosis managed the psychological aspects of diabetes, which helped improved the overall quality of care for patients with diabetes. Some of the complications include depression, stress, and anxiety, and these complications often led to more physical complications. Hypnosis used in conjunction with insulin treatments showed promising results, especially with stabilizing blood glucose and decreasing peripheral vascular complications. In addition, hypnosis also helped patients deal with their negative emotions in a healthier way. A separate study, conducted by Pressman and Cohen in 2005 showed the link between emotions and physical health. Those who displayed negative emotions following their diagnosis of diabetes were prone to more physical ailments. However, patients who experienced positive emotions such as happiness and excitement resulted in direct physiological effects. The study found that the nervous system responded to positive emotions, cortisol decreased as a result of the hypothalamic-pituitary-adrenal axis activation, and an activation of the lymphoid tissues was also present. What these studies mean for people with diabetes is that there is an option to help manage the negative emotions one feels when they are diagnosed with the disease, and this in turn helps manage the physical aspects of diabetes. 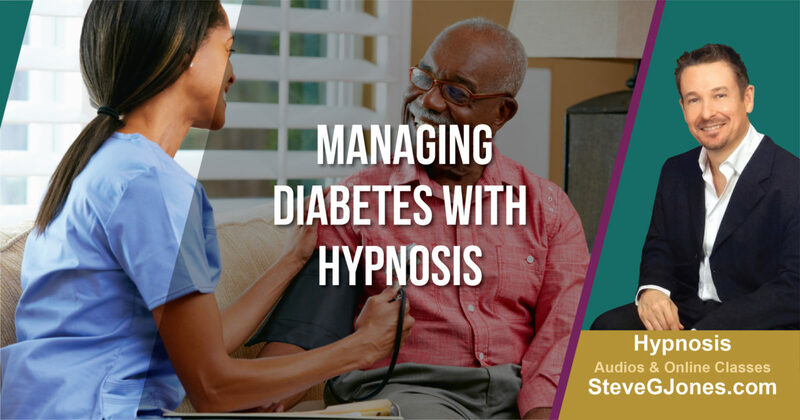 It’s important to note that hypnosis is not a cure for diabetes, nor does it claim to be; however, using it together with an approved insulin plan – as prescribed by your doctor – can help you manage the symptoms and side effects of diabetes.